The popular tower defence game known as Plants vs Zombies (PopCap Games) is now also on Playstation Vita, with iterations of this sound premise on almost every device imaginable. Is this Vita version able to capture the fun gameplay that has made this multimillion dollar franchise popular? The popular franchise comes to Vita. As tower defence goes the gameplay is fairly basic, you play within a grid similar to a chessboard placing your companions (who are the cute loveable plants) on your side waiting to defend the army of zombies invading your lawn. It’s a basic premise, but the reason PvZ stands out apart from its cute and effective art style is the options. You are given over 40 different plants that can attack/defend in various ways, from your trusty Pea-Shooter to the blockade known as the Tall-Nut. This allows the developers to slowly add new varieties of plants to your arsenal and varying enemies throughout the 50 mission campaign, this keeps it from becoming stale as they always add something fresh to experience. Not only is there a great variation to the plants and zombies, but the environments in which you play are adjusted after each 10 level stage to give a new challenge. The appeal of this game comes from the art style, it is very colourful, bright and the cute characters allow it to be charming to all ages. 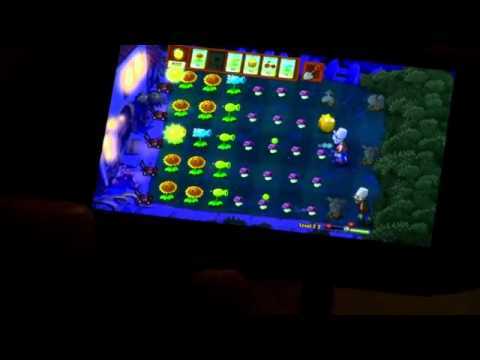 More than likely most of you have played a version of PvZ before and know how fun/addictive the gameplay can be, but what sets this version apart? Packing the full 50 missions campaign structure, you are also provided with an array of mini-games, survival modes, puzzle games, endless/horde mode and its own platinum trophy set, this game is not short on features. Adventure mode is where it truly shines, ramping up the difficulty slow enough to provide a challenge but not enough to make the game overwhelming for new comers of the genre. With the Vitas touch mechanics used in similar vein to the iOS version and also offering players to use traditional mechanics if need be, this iteration plays very well. Adding in the ability to collect sun (Which allows you to buy more plants) and coins via a simple tilt of the console is a simple yet brilliant idea, the included gyroscope functionality of the Vita is used to perfection and this became my go-to mechanic during the game. Although I did prefer the method of using the stylus on the DS version of the game to place plants, this is never a big issue. Few problems arise during the game however, sometimes your touch methods are not recognized and you will have to repeat your motion several times. Slow down does occur in some of the more hectic levels, when the screen is full to the brim with plants and the zombies attack, the slow down becomes very noticeable. These minor issues are forgotten however once you are in the swing of things, constant planning of your next move becomes a tonne of fun and justifies why PvZ has become a worldwide hit. You will also be captivated by the unique soundtrack, composer Laura Shigihara was able to make the music recognizable toe the franchise and the finale song alone makes the Adventure Mode worth the time to complete. What do I think of this game? It’s more PvZ. That is not necessarily a bad thing, the gameplay that we know and love has been ported to the Vita perfectly, adding a few unique features and keeping the fun in-check. If you are coming into this game expecting a great variation on the game we know and love, you will be disappointed. However if you are looking for a game that will provide hours of fun on-the-go with little problems, then PvZ is the game for you. Prepare to be watchful because you never know…When there is a zombie on your lawn. Jamie loves his Vita, he choose to bang Tali and he is clearly against zombies being on his lawn. He hopes to one day become a video games journalist, you can follow him on Twitter @Jamierock50, his ramblings on YouTube and his published work on Weekendnotes. I agree that is the better port, played it originally on 3DS.